NEW YORK (CNNMoney) -- Americans often fret about the price of gasoline, which has surged dramatically in recent days, fueled by turmoil in oil-producing nations in the Middle East and North Africa. But the price of gas in America lags far behind its European counterparts. While Americans tear their hair out at the pump, Europeans watch them enviously from across the Atlantic. Most Europeans pay at least double what Americans do. Some of them, including the Greeks and the Scandinavians, shell out even more. In the U.S., the nationwide average for the price of gas was $3.53 per gallon on Thursday, according to AAA. The price has risen for 16 consecutive days, jumping 34 cents. But that's still less than half the $9.28 per gallon paid in Oslo, according to Din Side, a Norwegian search and news site that monitors gas prices, among other things. Who's paying what: Most Europeans, including the British, the Irish, the Germans, the Italians and the French, pay somewhere between $7.50 and $8 per gallon, according to the International Energy Administration. 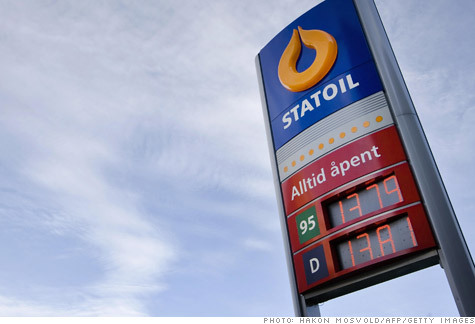 Danes paid $8.20 per gallon at the end of February, according to the IEA. Greeks -- no strangers to economic hard times -- were paying $8.45. Many people may assume that Europeans pay a lot for gas because they don't have their own source of fossil fuels. In fact, they do. Norway is awash in oil because of its thriving oil industry in the North Atlantic. The United Kingdom also has access to the oil fields in the same region. Italy has deep corporate ties with Libya. Its oil production company, Eni, is the largest producer in Libya. But even in the best of times, without civil war in Libya, gas in Italy is expensive when compared to the U.S. Italians on average paid $7.77 a gallon at the end of February, according to the most recent data from the IEA. "The difference between countries comes down to taxes and subsidies," said Tom Kloza, the chief oil analyst for Oil Price Information Service. "Prices are incredibly high in Europe because of the stiff taxes that EU countries put on fuel. The same holds true for many other countries." The Japanese also pay more -- $6.30 at the end of February -- and so do the Canadians, at $4.49 per gallon, according to the IEA. Who's got the cheapest gas? That distinction goes to OPEC nations throughout the Middle East and North Africa, as well as Nigeria and Venezuela. "There are some countries, Venezuela comes to mind, where the street price is subsidized and you might hear about a very cheap retail number," said Kloza. "The same holds true for India and China and some other emerging countries where the prices are subsidized by the state." Even in 2008, when average gas prices reached a peak of $4.11 in the U.S., the governments of OPEC nations were able to keep in their gas prices artificially low. In 2008, gas was still retailing for less than a dollar per gallon in Saudi Arabia, Egypt and Nigeria, according to research company AirInc. In Venezuela that year, gas was selling for 12 cents a gallon. And don't expect them to soar in these countries, like they did here, anytime soon. "I can tell you right now that if any of the prices in those countries are more than 50% of what we're paying, I'd be very surprised," said Peter Beutel, of energy risk management firm Cameron Hanover. "They're all heavily subsidized." Falah Aljibury, an energy analyst who has advised oil ministers from Iraq and other OPEC nations, said the subsidized gas prices can be used as a means of controlling the population. "[The price] depends on what the rulers want it to be," he said. "In Saudi Arabia, [gas] is subsidized like food is subsidized. It's a way for the government to quiet down the people." People have become increasingly rebellious in the Middle East and North Africa, toppling or threatening regional governments. The Saudi monarchy has taken note of their neighbors' troubles, and acted accordingly. "Given what happened in Tunisia, Bahrain and Egypt, the Kingdom [of Saudi Arabia] decided to release more money to the poor, to reduce the attempt of the people to have clashes with the government," Aljibury said. But control can work both ways. Beutel said that the governments of China and Nigeria have tried to lift subsidies on gasoline, but "it always brings out tons of people to complain." Aljibury said the governments of Iraq, Iran Egypt and Syria have also tried, unsuccessfully, to raise gas prices. "Sometimes they jack it up, there's a demonstration, and they will bring it back to where it was before," he said. Where gas prices hurt most in the U.S.